The 10 Best Bike Shops in Iowa! Bike shops tend to fill their own, unique category when it comes to retail shops. Not only do they offer a specialized product in bikes, gear and sometimes even repairs. But often, the staff offers expert knowledge and can be lifelong participants in the sport themselves. Every bike shop is special, and the shops in Iowa are no different. Get your wheels turning at these 10 great bike shops in the state. Goldfinch Cyclery is your neighborhood, friendly bicycle shop in Cedar Rapids. This full-service bike emporium provides everything you need to get those wheels moving. Whether you’re looking to build a bike from scratch, or repair the one you already own, even if you just want to stop by and talk shop with a soda in hand, Goldfinch Cyclery is the spot. They strive to be a community hangout spot where you can park your ride and enjoy some company. Whether it’s a road bike, mountain bike or something in between, Sugar Bottom Bikes in North Liberty has what you are looking for. Taking their name from the area of mountain biking trails located just down the road in the Sugar Bottom Recreation Area, Sugar Bottom Bikes is a great resource to hit up and before or after your ride, and if you need a bike to borrow, they have you covered there too. Featuring programs as well as products, check out Sugar Bottom Bikes for maintenance courses, workshops and a friendly place to hang out. 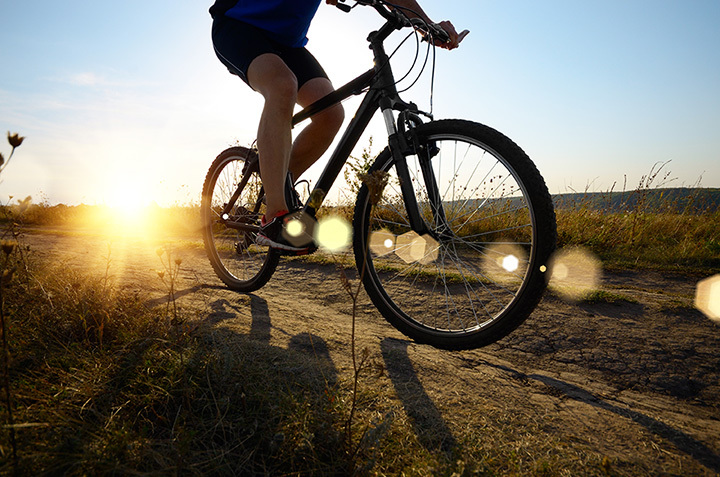 Few other places in Iowa offer so much scenic biking scenery than Decorah, and throughout the rolling hills and picturesque Midwestern landscapes, if you need any help getting your bike riding its finest, Decorah Bicycles is the place to be. Featuring bikes with fat, skinny and rugged tires, plus every accessory you’d ever need to enjoy your ride, Decorah Bicycles also does repairs, rentals and retail on new and used bikes plus apparel and accessories, making it your one-stop shop for all your biking needs in Decorah. Catering towards the Iowa State University population and surrounding community of Ames, Skunk River Cycles has a full line of your favorite bike models for sale, and offers a full-service maintenance shop that you can get you up and ready to pedal. Special to Skunk River Cycles is their exclusive financing plan for purchases over $300, allowing you to pay off your new ride over 12 months, making for one sweet deal if you’re looking to get a new pair of wheels. Located on Gilbert Street in Iowa City, World of Bikes is quite literally just that, a whole world of bikes. Whether you ride on the road, gravel, trails or something entirely different, World of Bikes has the makes and models that can get you going there. Featuring a full-service repair station, as well as top of the line rentals, World of Bikes is also a heavy member of the community. Specializing in commuter and trade-in bicycles, 30th Century Bicycle is the perfect place to find a utilitarian bicycle that works for work and getting around town. Because 30th Century Bicycles operates with a lot of trade-ins and used bikes, the prices at this neighborhood bike shop are often more competitive than your average retail spot, but don’t think that means you’re not getting a high-end ride. The bike techs and store staff at 30th Century Bicycle aren’t dealing with low-quality bike parts and materials, and you can expect to find some top-end models at a great price when perusing the selection at 30th Century Bicycle. With three locations in central Iowa, including West Des Moines, Ames and Urbandale, much of the bike talk in the Des Moines metropolitan starts at Bike World. Featuring a full line of mountain, road and commuter bikes, Bike World also does repairs and rentals, plus loads of advice on the best rides around. Throw in the many different community events hosted by Bike World, including a Pedal to the Park which involves a bike ride to Principal Park for home baseball games, and it’s easy to see why Bike World is the center of the biking universe in West Des Moines and beyond. Featuring a full line of every type of bike you can imagine, including road, mountain, electric and multi-use, despite their terrific selection of excellent bicycles, Bike Tech in Cedar Falls is much more than just a bike retailer. Featuring repairs and rentals, Bike Tech also hosts and enables community events in the Cedar Falls area, ensuring their spot as a community staple for years to come. Whether you need it repaired, or you’re looking to buy a new one, even if you just want to chat with someone about the best trails in the area, Bike Tech can get you moving in the right direction. Serving Central Iowa for over 40 years, Rasmussen Bike Shop is a Des Moines institution built upon a big selection, great service and a friendly atmosphere. Stop on down to Rasmussen’s yourself to see all the bikes they have on display, and while you are there, feel free to ask anyone behind the counter what their favorite rides are in the Des Moines area. Featuring high-end rides at reasonable prices, whether you are looking for a new bike to add to the collection or hoping to repair an old one, Rasmussen Bike Shop has the tools and resources you need to get your wheels spinning. Located in the East Village of Des Moines, Ichi-Bike is a unique bike shop featuring some of the coolest custom bikes you’ll ever see on the streets. Ichi-Bike has a wide selection of electric and “acoustic” bicycles to choose from, with many brands that you don’t see anywhere else. While it’s fun to choose from the eclectic bikes found on the walls, if you really want a hip ride, you can team up with the Ichi-Bike team and get a custom ride featuring whatever you can dream up. For the coolest ride in town, Ichi-Bike is your one stop shop for something new to ride.